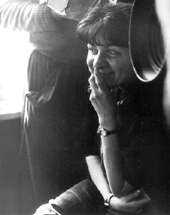 Márta Mészáros is undoubtedly the most famous female Hungarian director and also one of the most significant woman directors to emerge from central Europe, alongside the Czech Republic’s Vera Chytilová and Poland’s Agnieszka Holland. Like Chytilová, and to a slightly lesser extent Holland, her work has directly confronted issues of gender, society, politics and identity and has been acknowledged worldwide for its outspoken nature (a fact that is, perhaps, ironic given her films were made under a regime that is perceived as repressive towards displays of open criticism). Mészáros was born in Hungary, but in 1936 moved to Russia with her Hungarian parents, who had been lured there by Stalin’s openness to “fellow travellers” in his Socialist experiment. Once there, they were sent to the barren plains of Kyrgyzstan and forced to forge an existence for themselves. Stalin changed his mind about these foreigners, though, and a crackdown soon followed. Mészáros’s mother died in childbirth and her father vanished into a concentration camp following a show trial. Although the awful truth of her father’s fate had long been suspected, it was not until after 1999 that Mészáros received confirmation from the authorities that he had been executed. 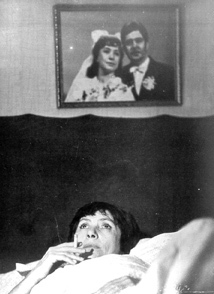 (1) These early traumatic experiences were to form the basis of her autobiographical series of “Diary” films during the 1980s, which broke new ground in Hungarian cinema in terms of what they showed politically as well as their being sensitive portrayals of the petulance of youthful rebellion and the processes of personal and historical memory. I met Mészáros in London, shortly after her first Diary film, Napló gyermekeimnek (Diary for My Children, 1982), was shown as part of a season of previously banned central European films. (3) Given this and the fact that her films were critical of both Hungarian society and the political system of the time, I chose not to ask her about the thematic nature of her work (which has been covered in great detail by Portuges) but concentrated more on the process of making feature films in the period. Andrew J Horton: How easy was it for you to move from being at film school to becoming a director? Márta Mészáros: I went to film school in Moscow. I didn’t go to a Hungarian film school since this wasn’t easy for a woman. In fact, at that time, a woman had never been enrolled at a Hungarian film school to study directing. And this was a really big problem. But, you know, I’d lived in Russia before, and my knowledge of the Russian language was very good, so I decided to go to the Moscow film school [VGIK, the Russian State Institute of Cinematography]. At that time, it wasn’t easy because it was the ’50s. There weren’t many films being made—only ones about the wise and beautiful Stalin. But there were some very, very good professors at the Moscow film school—Dovzhenko, for example, taught there at that time, and Pyriev, Gerasimov, Kuleshov and many, many interesting men. (4) But it was only a theoretical school. There wasn’t the money for doing any practical work. It was very good for understanding culture, literature, and for seeing films. But not for doing anything practical. This was the school’s biggest problem. The only thing they did occasionally was still photography. So after graduating and returning to Hungary, I decided first of all to make a documentary. This was around 1956 – the time of the revolution in Hungary. The political atmosphere was very interesting, with a huge opposition to Communism emerging and part of the Hungarian intelligentsia, writers and journalists, strongly in support of democracy. And I made a documentary about the poor lives of the people. The officials hated my film because it was about life under Communism, showing how it really was. But it was the truth—I captured the ordinary lives of these people and their problems. I did it many times. After 1956, you know, there was a deep depression, because Imre Nagy [the leader of Hungary during its brief liberal experiment] was killed and many people were killed during that time and the political atmosphere was terrible. I made my film Napló szerelmeimnek (Diary for My Loved Ones, 1987) about this period and many other directors have made films about this time. In general in Hungary, both the music and film traditions have been very strong. I don’t know why, I think it might be because of the language. The Hungarian language is very beautiful, but it is totally different from those of our neighbours. So we’ve always had very strong directors. [Here, Mészáros is alluding to the theory that Hungarians are forced to use non-verbal communication if they want to express themselves internationally. Her point shows she has a great streak of Hungarian pride – AJH] Zoltán Fábri, István Szabó, they made some very interesting films. But really the man who showed us the new political way during the 1960s was [Miklós] Jancsó with Szegénylegények (Round-up, 1965). The film is about 1956. I mean, its story is a historical one but the ideas came from Jancsó and his thoughts on the political situation. It was a new style for communicating about Socialism, Communism, and dictatorship. And the film was accepted [by the censors]; many young people gathered around Jancsó and made some very interesting cinema. AJH: What kind of people were in charge of censorship? MM: Among the apparatchiks, there was one man called György Acel; he was very Communist. He was a principled, ideological Communist, not a career Communist. AJH: Was he the Culture Minister? MM: No, no, the Culture Minister constantly changed, but he was always there. He was the Party’s ideological man, who controlled culture. This was a very important position as culture was very important to the Communists, and so there was always somebody very strong and interesting in this position. AJH: How much did the government intervene in the films being made? MM: The situation in Hungary wasn’t as bad as in other countries. In Poland, for example, censorship was much tighter, whereas in Hungary everything was so open. All the film directors could travel if they got a film in Cannes, Venice or any other important competition, and many people went to New York. There were also many co-productions with, for example, Germany, France or Canada. It was open. But the problem of censorship was always around these two questions: 1956 and the idea that the Soviet Union was a poor and backward country. Of course, many directors tried to touch on these themes and skirt around them, such as Szabó and Jancsó. But only my films tackled them directly. I don’t know why. The studio director was never a member of the Party (6). Never. And when you wrote the script you would give it to the studio first, and it would be discussed by a panel. They would talk about dramaturgical points, but never political things. There was always very good communication between the screenplay writer and the film director. Then you’d get the final script and the studio director would decide whether to make the film and how much the budget should be. The script would then go to the Culture Ministry and the script was censored (either whole scenes, whole scenarios, or sometimes just wording). Generally the process was successful. I don’t remember, but maybe there were one or two of my scripts that had problems, but in general it was very open. When the film was finished, the studio showed it to a Commission that comprised people from the studio, and the Ministry, and sometimes Acel came if it was an important film. But in general, they didn’t ask for many changes. When they did ask for changes, they were usually only very little. With Jancsó, they asked him to make some small changes in one of his co-productions about the revolution. But he refused to make the changes and they accepted the film—it wasn’t a problem. There was a problem, however, with my second diary film since the story is set in Budapest and Moscow. The Ministry wanted to change the part with Russia, to alter sections. But I didn’t want this, and they accepted it. There were many discussions, but they accepted. The film showed at the Berlin Film Festival in 1987, and I got the Silver Bear and was also nominated for a Golden Bear. AJH: Were the classic films of the 1960s and 1970s expensive to make? AJH: And a director would have a salary paid by the State? MM: Yes, all the directors had a salary. It wasn’t very big, though. Worst of all, we didn’t have any rights to our own films. AJH: Did the studio own them? MM: No, the government. For me, this was a problem. Örökbefogadás was a very big success and many countries bought the local distribution rights. It played in 100 countries. So money came in for this film, but never to me. Towards the end of the regime, we asked this be changed and so they introduced a new system. It wasn’t so wonderful, but it was better than nothing. Now it’s different so that if your film shows on Hungarian television they pay the director some money. But, for example, they don’t pay any money to the director if Hungarian films show in Poland or the Czech Republic. I know this very well because I live between two countries—Poland and Hungary—and my films are often on Polish television and I never receive any money. On the other hand, Polish directors do get money if their films are shown under similar circumstances. This was a problem because often if the administration liked the film and Acel thought it was good, it would make extra money. It was a very bad system. It was especially bad for directors, but also cameramen and actors, who had a very poor standard of life. For example, my film Örökbefogadás was in the Official Selection at the Cannes Film Festival, but I had only 100 francs for my whole stay there. Some Hungarian people living in France had to give me some money. It was terrible! My film Örökbefogadás was nominated for an Oscar, but I didn’t have the money to go. Some Hungarians living in Los Angeles had to give it to me. We just all felt so terribly poor. At Cannes, for example, directors would go out for a coffee and I couldn’t even afford to do that with them. Jancsó had to work in Italy, for example, and Szabó went to Germany, some cameramen went to the United States. I did co-productions with France and Germany—for the money. And I think this was also a kind of censorship; it was not only political censorship, it was economic censorship. If it was a very good film that they liked, they’d give the director extra money. AJH: What was the structure of the studios? MM: There were five or six studios and in each studio there were five or ten directors. But it was possible to change which studio you worked with. You could take a screenplay to one studio and they’d maybe say, “no, we don’t have the money”, and you could go to another studio. But generally it wasn’t important which studio you worked with, because the system was the same. If one studio said a script wasn’t good enough, it was quite probable that another would say exactly the same thing. AJH: So what was it that distinguished the studios? MM: It depended on who was director of the studio. If they were interesting, it was a good studio. I was in a studio where the director was István Nemeskürty. He was a writer, screenwriter and historian, and very important in his time. He was a very good producer and gave money to young directors to make good commercial films and historical epics. 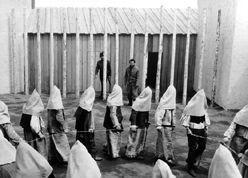 And he also gave money to more experimental films, such as those by Jancsó. I think Nemeskürty was, during the ’60s and ’70s, one of the most important people in Hungarian film. Now, he’s changed; he’s become a huge nationalist. But in the golden age of Hungarian film, his name was always present on all the good films. Nemeskürty went on to become a part of the administration and the Ministry, and now he is very nationalist. He’s not an interesting guy to me now. AJH: The old studio system of making films has completely changed. How do you feel about that? MM: When Communism collapsed and the system changed, it wasn’t easy because essentially the administration didn’t have any idea of what it should change into. They believed the old system wasn’t good, and so they destroyed the entire studio infrastructure. But the old system was good—for a small country like Hungary—in the sense that we didn’t have private producers or private distributors. We’re only ten million people. We need, absolutely need, the government. The big distributors are only after money and to do this they have to show American films. Sometimes, in little cinemas there will be Hungarian films. But in general, we have a lot of problems. Now you hand your script to a studio, but they don’t have the money. The script has to go to an advisory council of around 11 or 12 people, one of them will be a film director, one will be a critic, I don’t know exactly, they read the script and they give money for the studio to make the film—but only half the money. My last film needed 200 million forints [USD 800,000]—it’s normal for a film these days, a very modest price. But they gave me only 20 million [forints], and we had to go looking for other producers and co-productions for the rest of the money. AJH: So for your films what percentage of the money comes from outside of Hungary? MM: Half, but many young people can make a film for just 20 or 30 million forints [without going abroad for money]. I was at the Magyar Filmszemle [Hungarian Film Week, held each year in Budapest], and this year I saw some very, very good films made by young directors on this “nothing money”. Now, I’m preparing a film in Poland about Marie Skłodowska-Curie, and we’re looking for money from Eurimages [the European co-production, distribution and exhibition fund]. It’s a co-production with France, and I’d like to work with a French actress. After Skłodowska, there’s never been another woman of such genius. But her life wasn’t happy, it was full of tragedy and drama. AJH: A lot of the recent projects that Eurimages has funded have had big-name directors. Do you think it’s easier for you to get Eurimages because you are well known? MM: Hmmmm, no. I think it depends entirely on the script; they’re looking for an interesting story. Maybe for the Curie film it might help that Márta Mészáros is making this film about this truly amazing woman. Maaaaaybe, it helps a little, but in general, no. But they do have problems. In the beginning, Eurimages was very good, but now they’ve become too big (8) and there’s too much bureaucracy. Some people there don’t understand what it means to make a film, and they ask you stupid questions. Now it’s not so certain that you’ll get the money. Of course, they have the money, but when you know someone important there… it’s better. I’m working on a co-production with Italian television as well. There’s only one possibility [to get things to work]; pay the important guy, and they accept the project. It’s openly corrupt and people know that. Producers will go to these guys and give them money. But in Italy, it’s always been like that. AJH: Recently, the Hungarian government has given additional money for large-scale historical epics. MM: It’s wrong to give so much money to a couple of historical films—2 billion forints [8 million dollars] (9)—and neglect new directors making films about contemporary subjects. The government can do this because you have a Minister of Culture who hates cinema. He’s a cultured man, but he likes music and he gives money to this. But he hates films and filmmakers. Our problem is that we are a new democracy and we don’t have a democratic system in our culture. We have only two big parties: the right-wingers and the former Communists, who are now Socialists. You [in Britain] have an old democracy, but for us it is very new. In Poland, it’s not so different to Hungary, but Polish television still gives money to make Polish films. In Hungary, television has been absolutely destroyed. They only make propaganda films for the government. AJH: Why do you think it is that in Poland companies like Telewizja Polska and Canal Plus Polska are involved in film production but this isn’t happening in Hungary? MM: I don’t know. I think this is a historical problem, because the Polish mentality has always been very supportive of Polish culture. Culture in Poland was symbolic of liberty. Their battles with Germany and Russia, it was all over their culture; the big writers, the big poets, the big film directors, the big theatre directors and it was always present in literature, and they had their responsibility. In Poland, for example, Andrzej Wajda could do what he wanted. If he wanted to do a classical film, they gave him the money. And in Hungary, for Jancsó, nothing. And the people in Poland, they absolutely love their culture. AJH: It seems that the Ministry has a very conservative view of what constitutes culture, its heritage, the past. MM: Yes, yes. New culture isn’t important to them. And they are only interested in culture that goes with their political way of thinking. Historically, though, it’s always been like this. I don’t know the story exactly, but I think it was like this before the Second World War. Before the war, Hungary wasn’t a fascist country, but it was nearly fascist. Many important writers and philosophers in Poland, [Leszek] Kolakowski, Czesław Miłość, [Wisława] Szymborska, write about the historical truths of the 20th century, but in Hungary they don’t. They are anti-Semitic, and they almost never speak about why Kádár [Hungary’s post-1956 Communist leader for more than three decades] became a big political figure. Only now are the first books examining the topic. AJH: But there are a lot of good Hungarian film directors who have tackled Hungary’s history. MM: We have many good film directors, it’s true, but the Hungarian psychological make-up was really captured in Jancsó’s films. Sometimes Hungarians do something, but in general they only observe. In Poland, it’s not the same. If there’s a problem, they’re out on the street demonstrating or they go on strike. In Hungary, never, never. Maybe it’s a temporary thing. I don’t know. But I see a big difference because Poland also has a lot of problems, political problems. In Hungary, people never say things directly. They wait. You know, Hungarian people came from Asia. In historical terms, it wasn’t so long ago. Only one thousand years—it’s nothing. When you see the passive Asian temperament, it’s the same sometimes. Now our roots are very mixed, of course. When I was shooting in Kyrgyzstan (10), my crew, who were mostly young, first hated it but after a few days everyone loved it there and they all share an enormous nostalgia for it now. Some of them have gone back on their own since. “Banned! The films they didn’t want you to see”, 5-10 February 2002, Riverside Studios, London, organised by the Czech Centre, the Polish Cultural Institute, the Hungarian Cultural Centre and the Slovak Film Institute. Aleksandr Dovzhenko (1894-1956) is best known for his lyrical film Zemlia (Earth, 1930), which has been described as “a prerequisite to viewing anything by Tarkovsky”. Earlier this year, he was honored with a complete retrospective at the Lincoln Centre in New York. Lev Kuleshov (1899-1970) was a founding father of Soviet cinema, his Neobychaine priklyucheniia mistera Vesta v strane bolshevikov (The Extraordinary Adventures of Mr West in the Land of the Bolsheviks, 1924) is still widely admired. History has shone less favorably on Pyriev, and he is now mainly remembered for his Stalinist musicals, such as Kubanskie Kazaki (The Cossacks of Kuban, 1950). Sergei Gerasimov (1906-1985) had his most famous work ahead of him at the time Mészáros was at VGIK. His Tikhii Don (Quietly Flows the Don, 1957) is a classic adaptation of the novel of the same name by the Nobel Prize-winning Mikhail Sholokhov. Mészáros intriguingly refers to her set of “Diary” films as a “trilogy”. In fact, there were four films in the series, with the final instalment (in fact a “prequel”), Kisvilma—Az utolsó napló (Little Vilma—The Last Diary, 2000), considered by most observers to be significantly weaker than the other three. Mészáros (and the author) has used the word “studio” throughout the interview, mirroring the Hungarian word stúdió. It should be noted that the term has a rather different meaning in Hungary to the normal sense of a company with facilities and equipment for making films. Stúdió in this context equates to the Polish model of the “film unit”, a Communist equivalent to a production house, with the studio director acting as financial manager and head dramaturg. Actual shooting of films was done (on the whole) at the state-run Mafilm studios. The official exchange rate of the time was around 35 forints to the dollar, making the budget for Jancsó’s film under half a million dollars. In practice, the black-market value of the forint was lower. Eurimages was formed in 1989 with 15 member countries. Since then, the number of countries who are eligible to join the fund has grown significantly as non-EU countries have been integrated into European structures. At the time of writing 27 countries were members of the fund. The level of funding, however, has not kept pace with this expansion. Mészáros is referring to A Hídember, which was almost universally condemned in the Hungarian film world. The film, funded by the right-wing coalition government, was a patriotic historical epic released in cinemas just before the general elections in 2002. Critics have maintained it was a glossy and expensive piece of political propaganda designed to keep the ruling parties in power. If it was, it failed—the election was lost to the reformed Communists. See Felicitas Becker, “The ad that failed”, Kinoeye, vol 2, no 10, 27 May 2002. 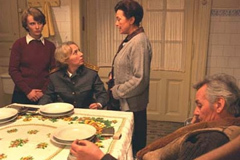 The shooting was for the fourth “Diary” film, Kisvilma—Az utolsó napló (Little Vilma—The Last Diary, 2000).